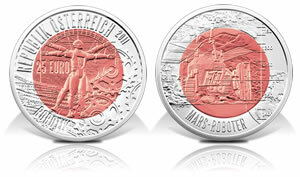 The Austrian Mint has issued the 2011 edition of its highly sought after niobium and silver bimetallic coin, this year featuring Robotics. The Austrian Mint has issued a 20 euro silver coin celebrating the life of explorer and Imperial Botanist Nicholas von Jacquin. This coin is part of the European series, which includes 8 countries that are issuing a coin this year as part of the "Europa Star" program. 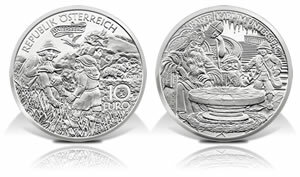 The Austrian Mint in Vienna has issued the fourth €10 silver coin in its popular series "Tales and Legends in Austria." 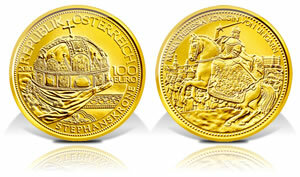 The new coin deals with the old legend of a famous emperor and his army sleeping deep beneath the mountain called Untersberg awaiting the recall to life. The second coin in the Austrian Mint’s new series "Rome on the Danube" is dedicated to the famous city of Vienna that began its existence as a military outpost on the northern borders of the Roman Empire. 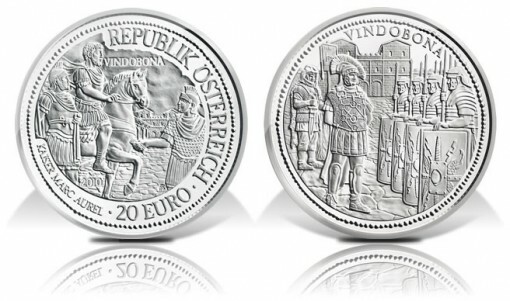 The 20 Euro Vindobona silver coin commemorative was issued on 8th September, 2010, and is eagerly awaited by coin collectors and fans of Roman history alike. Like so many Roman towns and fortresses VINDOBONA, Roman Vienna, was preceded by Celtic settlements. It was an area where two important trade routes crossed, the Amber Road from the north down to Italy and the River Danube itself. For some five centuries the River Danube formed an essential part of ancient Rome’s northern border against the barbarian tribes of Germania. The Austrian Mint’s new silver series called "Rome on the Danube" breathes life back into the ruined remains of the towns and forts that played such prominent roles in the life of the Roman Empire in Austria. Global warming, climate conferences, rising oil prices are constantly in the news. The earth’s resources of coal and oil are large but finite, and neither is a "clean" fuel. The dangers of atomic reactors and the thousand years’ threat of radioactive rubbish fill many people with dread. But our industry, our living standards, our life style demand vast quantities of energy — power to run our factories, drive our transport, run our house-holds. Is the answer to be found in Nature, in "Renewable Energy." This year’s 25 Euro silver-niobium coin from the Austrian Mint is dedicated to this topic of renewable energy. The niobium center is a shining blue this time. On the obverse the artist/ engraver Helmut Andexlinger has depicted the cycle of nature in a tree.